•Macon NPR interviewed me for a Macon-centric profile that came off really well. •WNYC’s Soundcheck Guide to the Allman Brothers…featuring me. 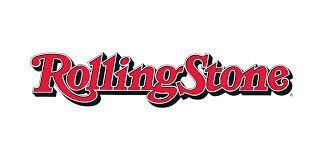 This includes not only a lengthy interview with me guiding host John Schaefer through the Allman Brothers music, as well as a full page write up. •A nice one with Paul Harris of the nationally syndicated American Weekend. 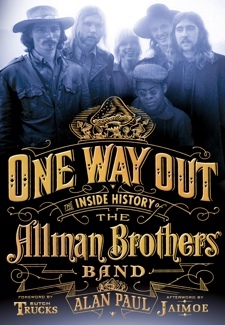 “Alan Paul’s just-published biography, One Way Out, is a thorough account of the group’s birth, several implosions and multiple resurrection.” – David Fricke, in his ABB overview. You can read the entire Guitar World review of One Way Out here. “Though enough tomes have been published about the Allmans’ troubled history to deforest half of Brazil, only Paul’s book gets all the principal figures assessing and confessing. However open and moving Gregg Allman’s autobio from 2012 may have been, Paul’s book gives a much fuller picture of the dynamics that drive every member — including why guitarist Dickey Betts remains so vexing.” – Jim Farber, NY Daily News, as part of this excellent ABB roundup. Read the entire, rather salacious, story here. You can read the entire Publishers Weekly review here. – The Atlanta Journal Constituion Read the entire review here. You can read the entire Kirkus review here. You can read the entire All About Jazz review here. •My segment on the great Leonard Lopate show on WNYC radio. This one was a special treat, as I have been listening to Lenny for years. •American Public Radio’s The Story featured the unlikely tale of Woodie Alan. •TAE Pittsburgh Business Radio. Great interview. •The Portland Oregonian. I like this one a lot. •Shanghai City Weekend, which hails Eli as an expat sage for his keen understanding of the pain of constantly saying goodbye to friends. •Many more here on the Reviews page, including USA Today. You can also see the USA Today review, part of a rounfup righ here. •Recommendations from China-based Westerners are particularly meaningful to me. for obvious reasons. Here are a few noteworthy ones: The China Beat and Jottings From the Granite Studio, the latter a blog I have long followed and considered particularly insightful about China..
•A nice piece in the mighty China Daily. •WSJ China Real Time blog interview. My most honest answer ever about being a male trailing spouse. •Lisa Belkin, of the New York Times’ Motherlode blog, picked up on Panda Dad and gave it a big boost. •My first-person account of the unlikely formation and rise of the Woodie Alan Band, from the WSJ Weekend section. •And the Pittsburgh Tribune Review wrote a really nice piece, as well. •A very nice early profile on SecondAct.com. 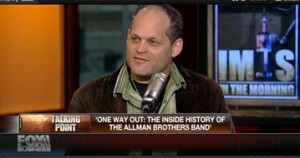 •One of the most in-depth thoughtful pieces you will read about me or Big in China, on Jambands.com. •Oakland, Ca’s East Bay Express. •Local Press abounds here: “Coffee With….” on Baristanet. •Two cool mentions on the prominent book blog, The Book Case. •A unique Southern Rock perspective on the book from Swampland. •The Global Times visited me in my house. •Beijing Kids magazine interview is here. •“Ultimate Cage mrch: Tiger Mom Vs. Panda Dad” – on the Jade Luck Club site. •An interview on the great Chinese basketball site, Niubball. •A really nice piece on Expat Women – I’m proud to be the first man featured on this site! •Expat Living 101 looks at Big in China. •A really nice interview on the blog, X-Expats.com. •Why Reading My Audio Book was a Remarkable Experience. •Being a Fu Man Jew. What it mean to me be a Jew in China. *Embrace the Chaos! My parenting thoughts on ProActiveDads.com.